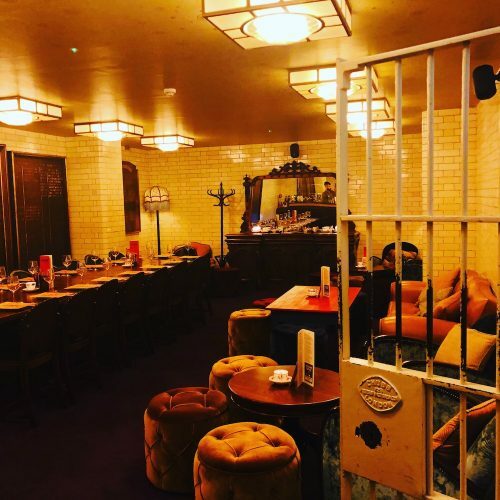 There’s nothing like the thought of a boozy lunch with a friend to perk up a dull Tuesday – particularly when the weather is suffering from an identity crisis and flitting between happy and sunny and moody and hailstone-y (it’s April weather, April). 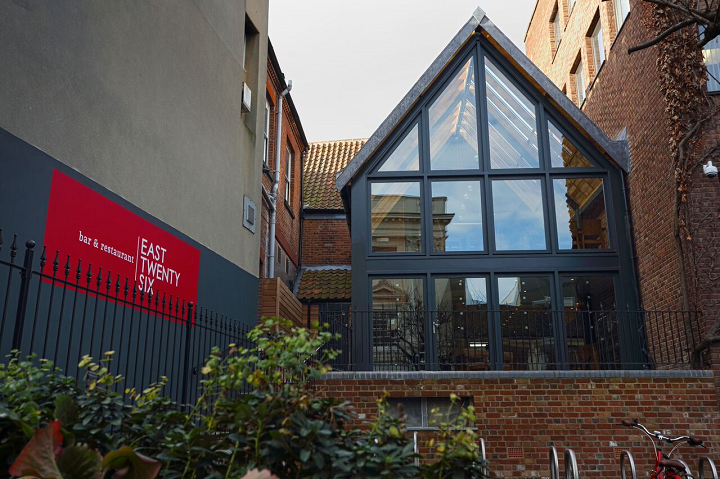 East Twenty Six is an upmarket bar and restaurant on Exchange Street, next to Norwich City College and opposite Côte Brasserie. 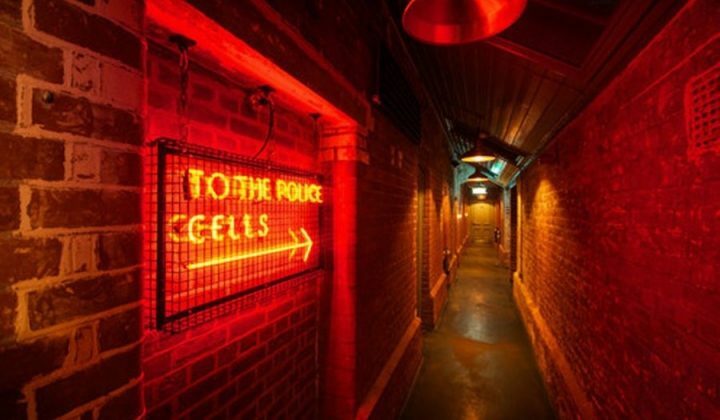 Owned by the same people that run the revered Iron House in The Lanes, East Twenty Six is just as popular, with Saturday night diners without a reservation fresh out of luck (I know, I’ve tried it). 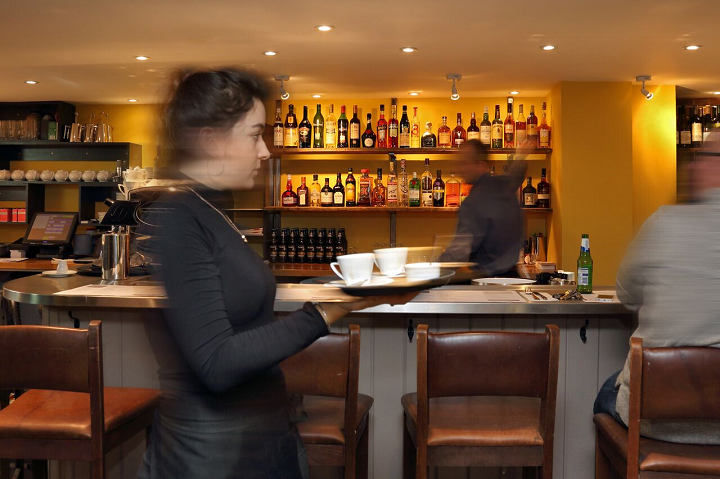 If you find yourself in this position, it’s worth sitting at the downstairs bar for a drink – the atmosphere is buzzing and you get front row seats to the theatre of the kitchen. 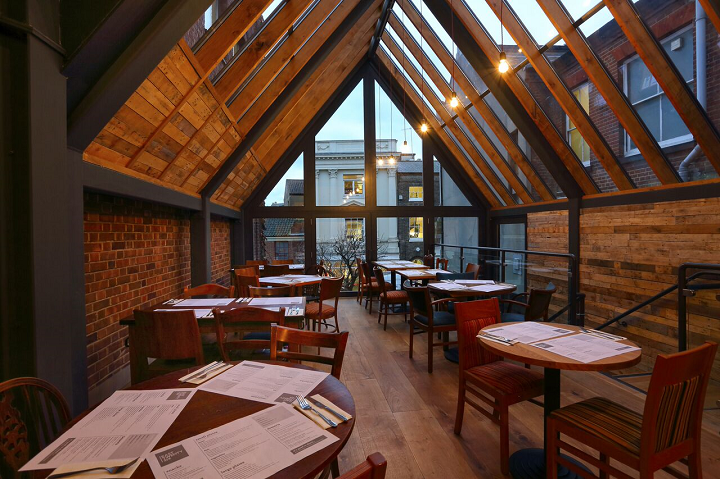 Today, we are in the upstairs dining area with its modern apex roof and industrial style lighting. The front is mainly glass with a great view of the street below and – today – the sun streaming through despite us arriving in a flurry of hailstones. 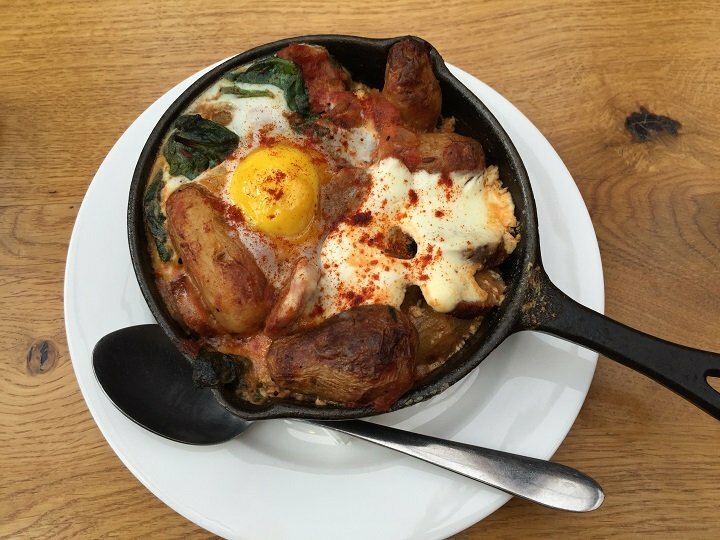 The convivial lunch menu consists of Tapas and cocktails, with dishes separated into meat, fish and vegetable, while the cocktail selection is numerous and inventive. 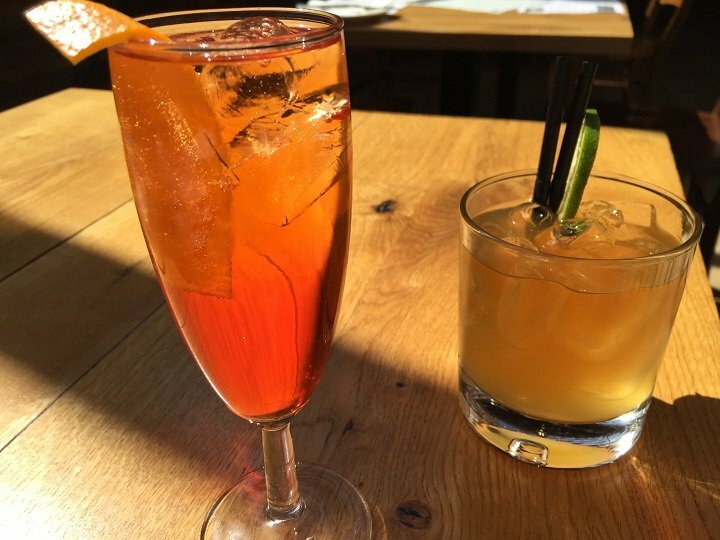 To get things off to a happy start, my dining companion Claire opts for an Apple & Roots (ginseng aperitif with apple juice and ginger beer), while I go for a tall Aperol Spritz with Aperol, Prosecco and soda water. These come with snacks of Binham Blue wontons which are warm, crispy and gooey, and Yemini style falafels. Now the hard part: choosing six dishes from a menu of 25, each sounding absolutely delicious. 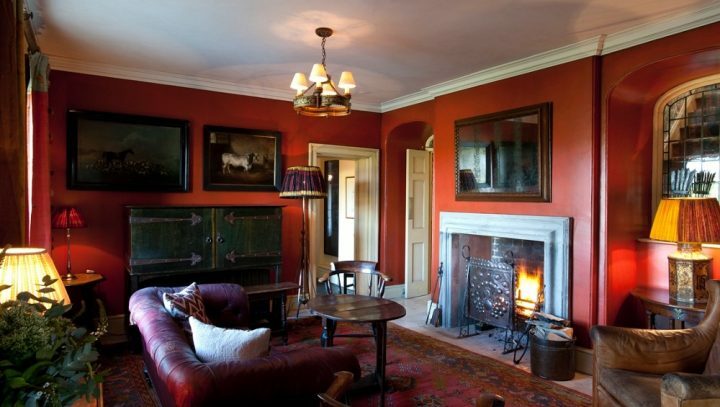 After much deliberation – and a rapidly-sourced pen – we tick the menu with our choices, whether that’s protocol or not. From the meat section, we opt for (take a deep breath) Smoked Korean style chicken wings with crunchy salad and toasted sesame seeds; East Twenty Six hash with sausage, potato, spiced tomato sauce, spinach, yoghurt and a baked egg; and Charcoal roasted bavette steak served medium rare with chimichurri sauce. From the fish menu, we go for salt cod croquetes with aioli and tiger prawns with edamame bean slaw and miso dressing. 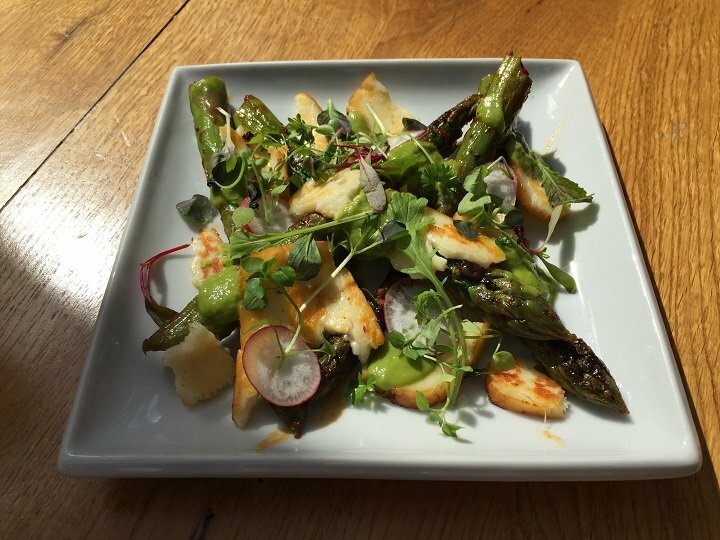 And from the vegetables selection, rose harissa marinated asparagus with smoked halloumi. Why so much meat, you might ask? 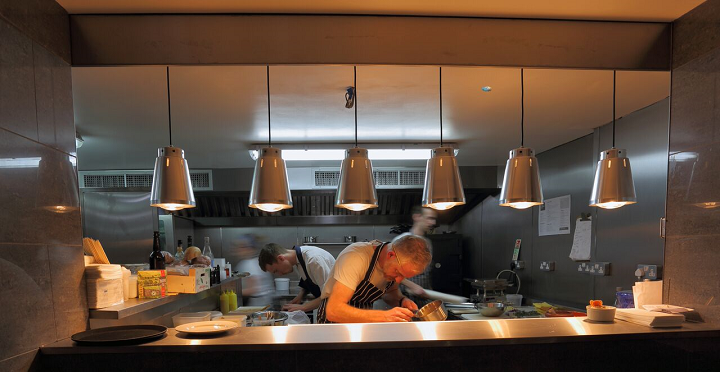 Well, East Twenty Six uses, the menu tells me, open flame charcoal cooking and sizzling planchas, while all the bread, sorbets and ice creams (more of which later) are made on the premises. The tradition with Tapas is to serve dishes as and when they are ready, with the asparagus and cod croquettes gracing our table first. The salty cheese goes perfectly with the charred asparagus, while the cod croquettes are crunchy on the outside and fluffy in the middle. So many dishes then start to arrive, I can’t keep track, but do remember that the sticky chicken wings with sesame seeds and the hash – which comes in a tiny iron pan and is comfortingly spicy and stodgy – being my favourites. Claire loves the tender bavette steak slices with smoky sauce and the large tiger prawns with miso dressing – their heads happily being yanked off like they belong to an ex-boyfriend! After an hour, there is just one tiny falafel left to tell a tale of carnage [it is only wafer thin] but we really can’t manage it and send it away (I do consider putting in my handbag but remember that I’m at ‘work’ and exercise some restraint). There is no way on earth I am fitting in dessert, yet find myself ordering the East Twenty Six sundae as if I’m not in the room, while my full dining companion goes for chocolate brownie with peanut butter mousse and popcorn ice cream – lordy! 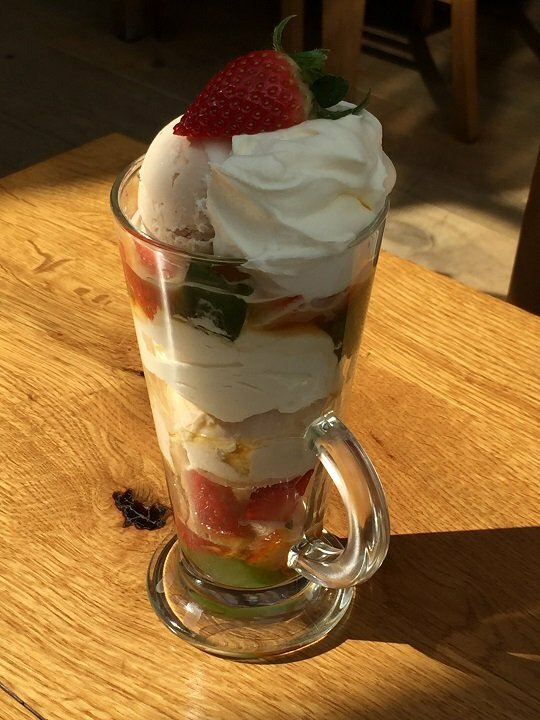 My sundae reminds me of being 11 years of age and having to kneel up on a chair to reach the bottom of the glass. This one is a twist on the classic, with strawberry ice cream replacing the usual vanilla and little pieces of mint and cucumber jelly bringing the sundae bang up-to-date. 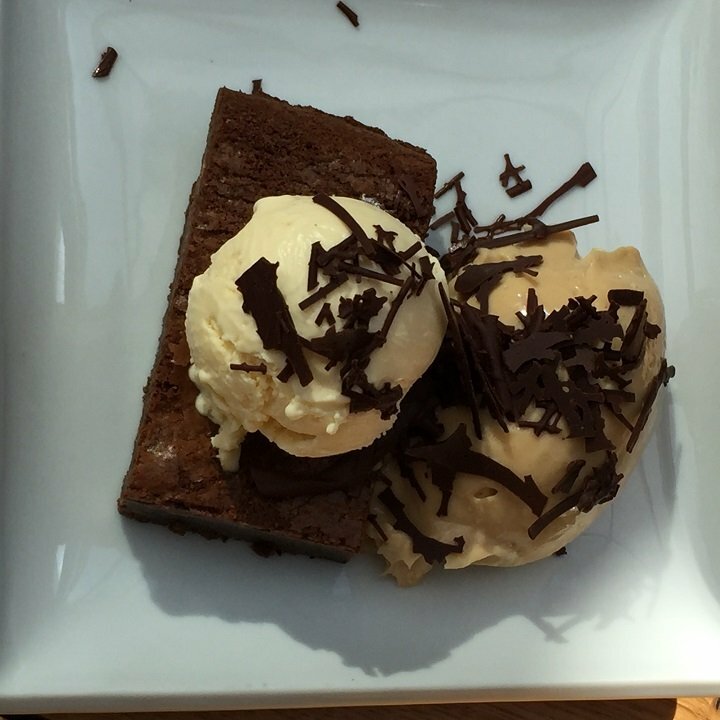 Claire’s face changes from one of sheer joy as she bites into the warm and gooey brownie, to confusion as she scoops up some peanut butter mousse and back to joy as the popcorn ice cream goes in – the mousse the only thing left on the plate. A perfectly executed Flat White rounds off a wonderful two-hour lunch which has been as sociable as it has delicious.